I am honored and humbled to have been officially nominated to run for the NAUI Board of Directors election this fall. I am asking for your endorsement, input, support and vote. NAUI has made incredible gains in the past two years and I would like to continue that success by adding balance to an already talented board by contributing what I know about sales & marketing management, successful business practices and the competitive and political nature of the diving industry. This year’s election will be all about building a strong NAUI Headquarters again in order to accomplish the things we need to do to regain our Leadership role in the industry. As part-time Directors with their own jobs, Board Members can only do so much. In order to grow the association and become competitive in the industry once again, NAUI Headquarters must be re-built on a strong foundation. In the coming months I will be discussing with the Membership specific things that NAUI could be doing to regain its Leadership role in the industry, based on conversations I am having with successful NAUI Members across the country and internationally. I’ve been fortunate to work in and out of the diving industry my entire career and my duties and responsibilities have always centered around diving and the business of diving in addition to my work in sales, marketing and management. Working in the industry I have gained experience and expertise in the University, Training Agency, Retail, Manufacturing, Travel, Non-Profit and Trade Association sectors. Thanks to six years as a Senior Business Consultant at the University of Houston I was able to gain expertise in the use of modern day sales and marketing tools in addition to working with hundreds of small business clients. All of this has helped me form an integrated and balanced approach to dive industry sales, marketing and management. NAUI has an incredible history and now, for the first time in many years, a real chance of regaining its leadership role as a quality oriented training agency. There is a lot of work to be done in building a strong NAUI Headquarters Staff that will work in unison with an elected Board of Directors. Programs, Products and Services need to be updated, improved or created to meet the needs of our Membership. We need to grow our presence in College and University Diving Programs. We need to grow and promote our Retail Dealer Network. We should be working on programs to grow our technical training department and our Public Safety Diver Programs. We need to expand the number of Dive Centers and Resort Operators that teach NAUI courses and offer referral training and/or job opportunities for our Instructors. Building a sizeable NAUI presence in the Caribbean would strengthen our Association. We need to give our non-instructor Members and our International Members the proper recognition they deserve and a voice in the association so we can meet their professional needs. And most importantly, we need to establish the long neglected practice of marketing NAUI as a quality training organization to diving professionals worldwide and the general public. Open and transparent communication is a key to NAUI’s future success. The Membership needs and deserves an open line of communication with their association and they must know that their organization is serving their needs properly and is doing everything it can to create opportunities for them domestically and worldwide. These are just a few of the things I would propose if elected to the NAUI Board of Directors. I will work with the current Board Members by adding a balance of expertise to the board. 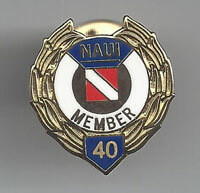 I will work with NAUI Worldwide Headquarters and the NAUI Service Group to bring in new 21st Century business practices while sharing with them a history of my 40 years as a NAUI Instructor and Course Director. And most of all, I will work with the NAUI Membership to help bring their needs, concerns and perspective to the Board. Lt. Bill Pfeiffer, NAUI 45432: I believe that Gene’s strong background in business and marketing, his vast experience in the scuba industry, and his obvious desire to bring NAUI back to a leadership position in the scuba instruction market make him an incredibly valuable asset who brings a lot to the table. I proudly support his nomination for election to the NAUI Board of Directors.